Electroencephalography (EEG) can significantly benefit from the 3D real time data visualization. 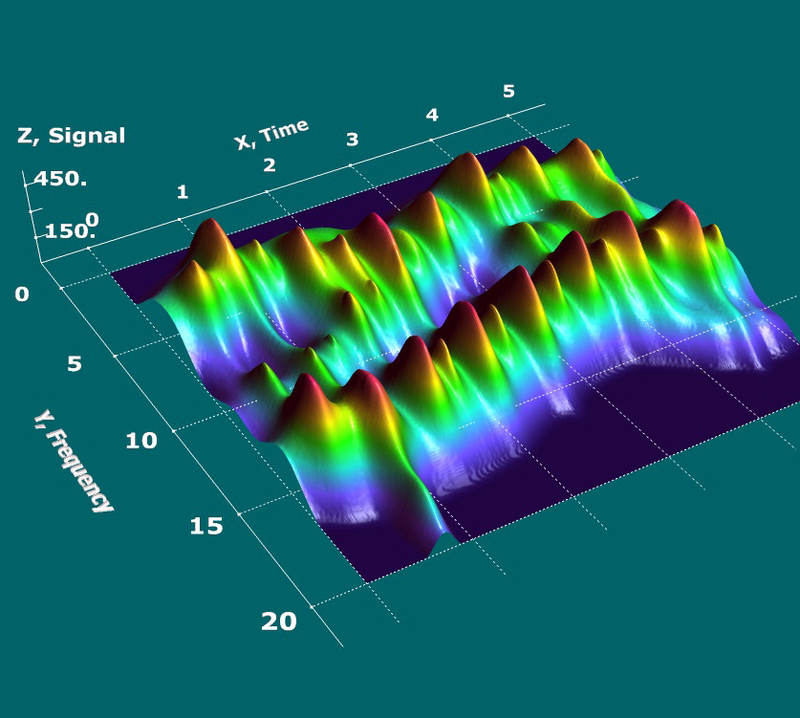 3D spectroscopy is known to be important in identification of the short lasting spectral features and their characteristics in time and frequency domain. Our graphics can display the time resolved EEG spectrum plot right in your desktop with orthogonal Time and Frequency intersections, 3D interactive markers, measuring tools and much more. Live time scroll mode is available for real time spectrum evaluation. Multiple spectra plots are supported for detailed correlation comparison between activity events and sessions. The new package offers maximum data perception within virtual reality scientific grade graphical interface, that is combined with exact data read back reports. Our motivation is to allow the user to perform an extraction of important signal spectral features by means of 3D spectroscopy. 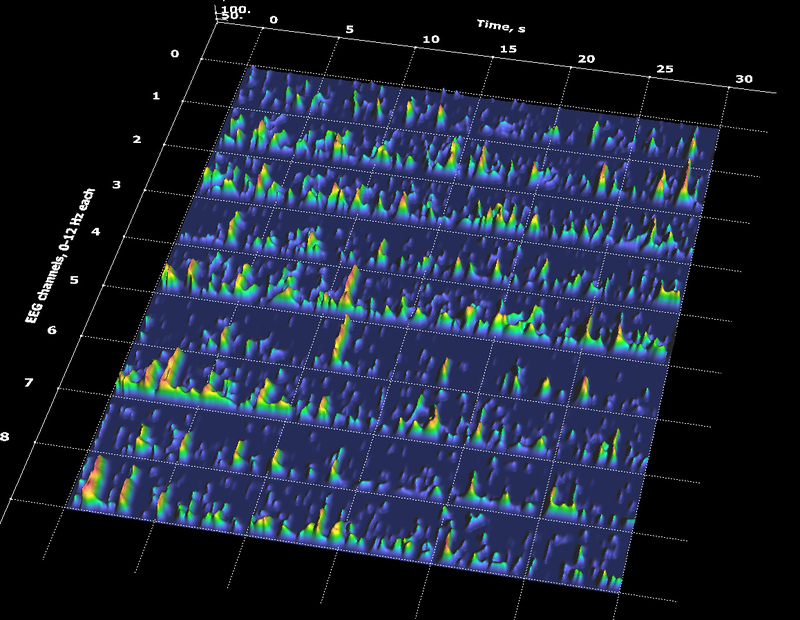 The 3D time and frequency domain visualization and analysis tools are useful for Neurodiagnostics, Neurology, Neuromonitoring, Biofeedback, and similar applications. 3D Time Resolved FFT spectra examples are presented below. Click the thumb to see full size image. 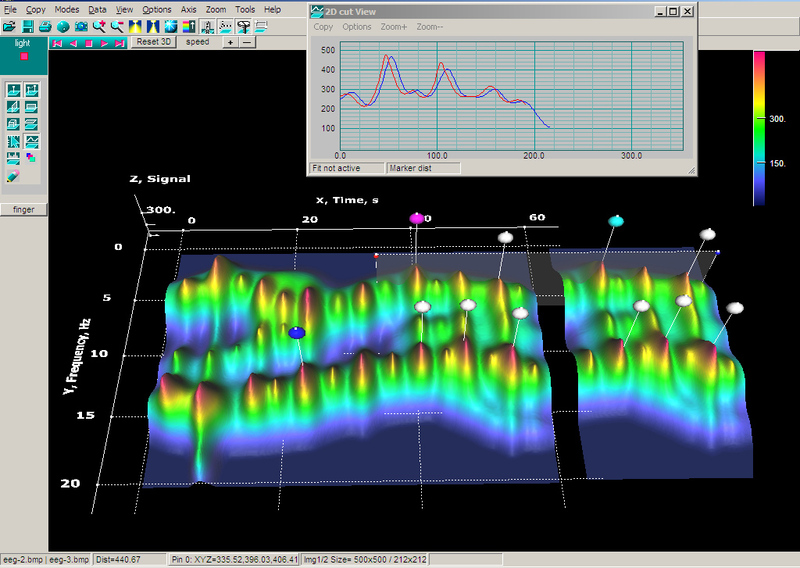 3D visualization of EEG time and frequency spectra. The new level of analysis in biofeedback. 3D axis, interactive measurement tools in same 3D visualization screen. Multiple spectra plot, markers and intersections plots for detailed correlation analysis between activity events in different sessions. Multiple spectra 3D surfaces for correlation analysis of the activity events in up to 64 EEG measuring channels. Comparison of the data between sessions in real time or post-session modes.